How did it sneak up on us so fast? Only eleven days to go, if my math is correct and it seldom is. I had so many big plans and have accomplished none of them. We have Christmas lights up and a tree but no cookie decorating parties, and what else, I don’t know maybe that was it. We did go to the Santa Soup Cook Off last night. It was packed. 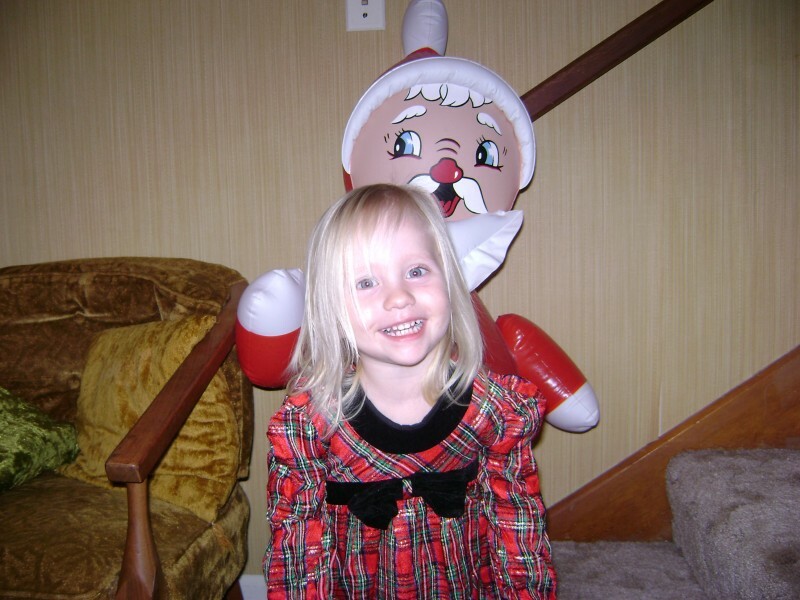 The Goblin Child sat on Santas lap and smiled for a picture. We looked at what was for sale, waited in the mile long line to sample the soups and decorated an ornament. It was just to much for the child, her head nearly exploded as we tried to sit and eat. The only thing she really wanted and that would get her to hold still was being with her cousins. Ava and Cade were there with their mom and she wanted to spend every second holding the hand of one or the other. With her bouncing off the walls we decided to forgo the Christmas concert. The music teacher always does an excellent job with it and we were hoping to see it again. As much as we had wanted to see it there was no way The Child would sit still long enough to enjoy any of it. As a consolation, to us, we went to look at the Christmas lights. There are a few houses around town that go all out and a farm east of town that decorates the whole yard. We let the child come stand in the front seat with us as we drove slowly around the yard. 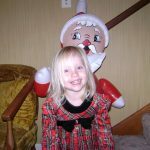 She oohed and awed at the over abundance of Christmas spirit but was mostly interested in anything Micky and Minny related. She was not happy to get back in the car seat but we had more lights to see. Another house back on the highway was aglow and visible from miles away. Not as big but brighter perhaps. She had no trouble in her overstimulated state staying awake till we got home to look at our neighbors lights once again. They are always impressive and have two Micky Mouses. wish you were here so we could go look at the flying reindeer out in Bull Valley. Sounds like you have enough lights out there, still, I wish you were here!